So often when we hear stories from developing countries, it is all about despair. That is partly reality and partly a result of the way media covers things. I didn't know exactly what to expect in Bangladesh, but I certainly thought "despair" would be part of it. Interestingly, after two days of learning about and visiting the programs being implemented by Save the Children and its parters in Bangladesh, I've seen more progress and results and hope than despair. On Monday afternoon, we visited the offices of Save the Children in Sylhet to learn about the MaMoni project. "MaMoni" means mother-child and it is an integrated safe motherhood, newborn care and family planning project managed by a group of partners, including Jhpiego, USAID and Save the Children. The program provides support, counseling and care for pregnancy, childbirth, breastfeeding, newborn care, introduction of complementary foods and family planning. 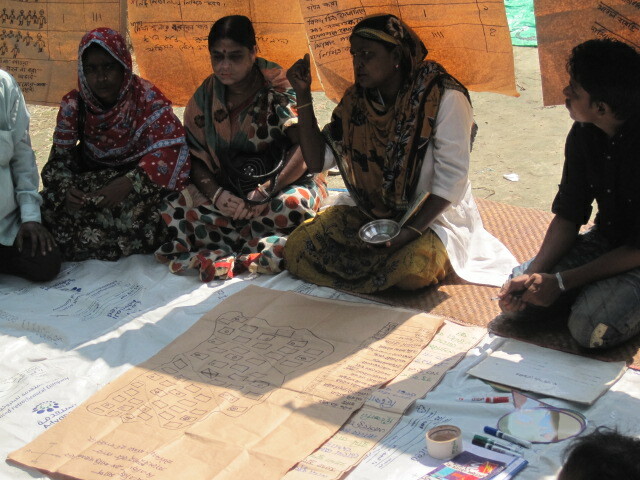 In Sylhet, the MaMoni project has been developing, implementing and testing systems that involve training local health workers and community volunteers to provide the required support to women and babies in their communities. On Tuesday, we had the opportunity to visit some of the communities where MaMoni is currently being implemented. Our first stop was at a birth centre in Shibpasa, Ajmiriganj that opened two years ago and provides round the clock delivery services and breastfeeding counseling. When we arrived we saw a waiting room full of women with their children and babies who were waiting to see a health worker. The babies were suffering from things like rashes, fevers and vomiting -- all things that could be life threatening if not looked after, but through the MaMoni project, these women now have access to health workers locally who can diagnose and treat many ailments and are able to arrange for transport to a larger medical facility when necessary. One woman who had given birth a week earlier was there with her mother and her newborn baby (that is the proud grandmother/worried mother pictured with the newborn). The new mother was experiencing some complications and was being monitored in preparation for transport to another facility. I was told that most women are seen by a health worker within an hour of their arrival at the facility, which provides round the clock care. 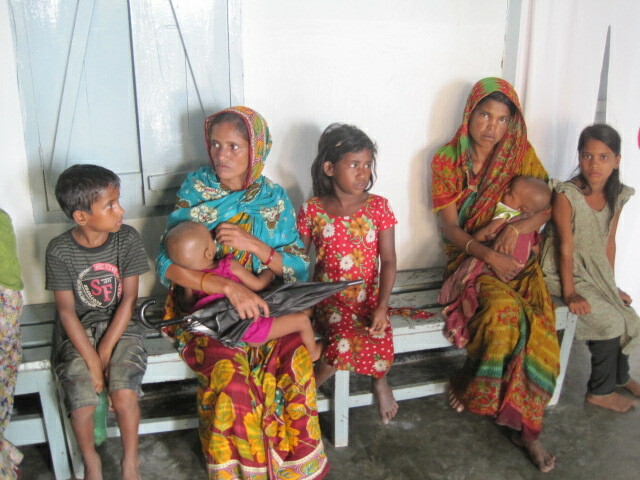 The waiting room has a television that plays a family drama with famous Bangladeshi actors that has been specifically scripted to reinforce important health messages. The birth centre provides services to women across the region and tracks them from identification of their pregnancy through to their birth, whether they give birth in the birth centre or at home. 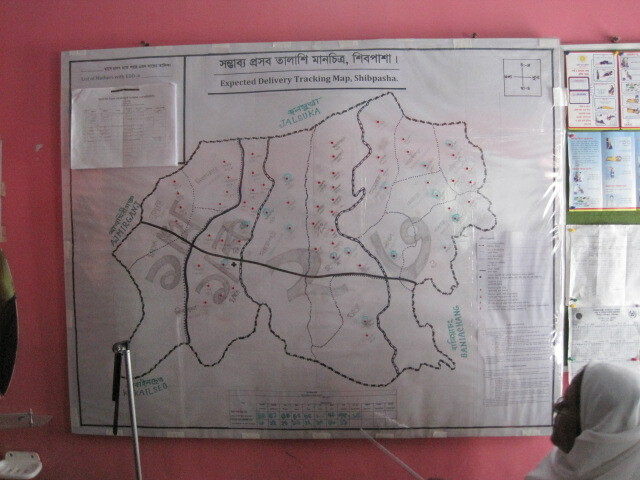 A large chart on the wall identifies where the pregnant women live, what their expected due date is, and whether they are experiencing any complications or difficulties that need to be monitored. The only thing that didn't impress me about this birth centre was the delivery room. 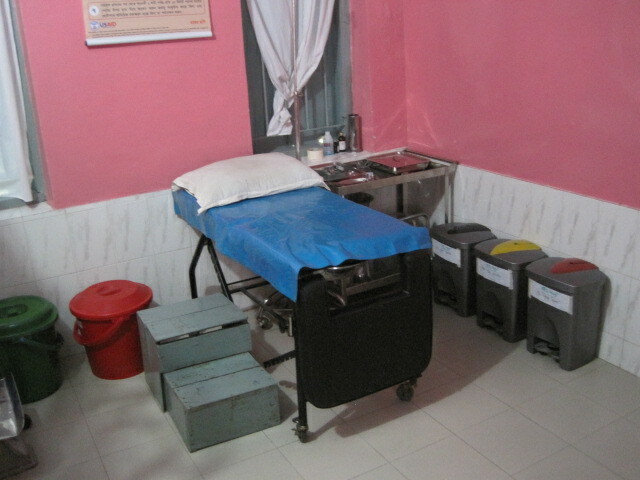 Although it was clean and they demonstrated strong practices in terms of sterilization and safety, it struck me as very cold. In Quebec, where I live, the midwife-run birth centres have birthing rooms that are designed with the intention of making the mother comfortable. They often look much like a bedroom and have a homey feel. 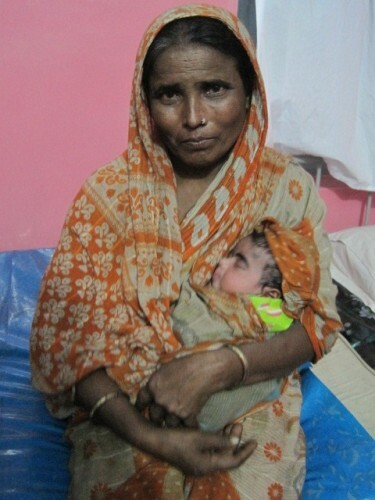 To ensure safe delivery, women in Bangladesh are being encouraged to have their babies in birth centres instead of at home. I do wonder whether the feel of the birthing room may be a barrier to reaching that goal. I wonder as well what else could be done to work with traditional birth assistants to help increase safety in home births so that women who do choose to have their baby at home have the necessary support too. 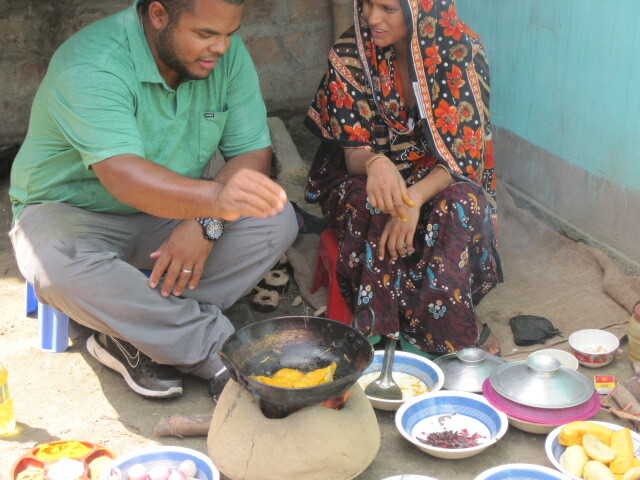 After visiting the birth centre, we went to a village to observe a one-on-one cooking and feeding demonstration. These sessions usually take place one-on-one in a woman's home when her baby is around six months of age,to facilitate the transition from exclusive breastfeeding to the introduction of complementary foods that will meet the child's nutritional needs. In Bangladesh, stunting is a big problem -- 41% of children under five are too short for their age. This impacts their cognitive development and also their earning capacity as an adult (stunted children earn 20% less as adults than children with normal growth). The critical time period for addressing stunting is pregnancy (mother's nutrition) and the first two years (exclusive breastfeeding for 6 months followed by continued breastfeeding along with the introduction of nutritious and varied complementary foods). Chef Roger Mooking who is traveling with us participated in a cooking demonstration with one of the mothers, cooking up a meal that included fish, rice, greens, pumpkin and other foods. 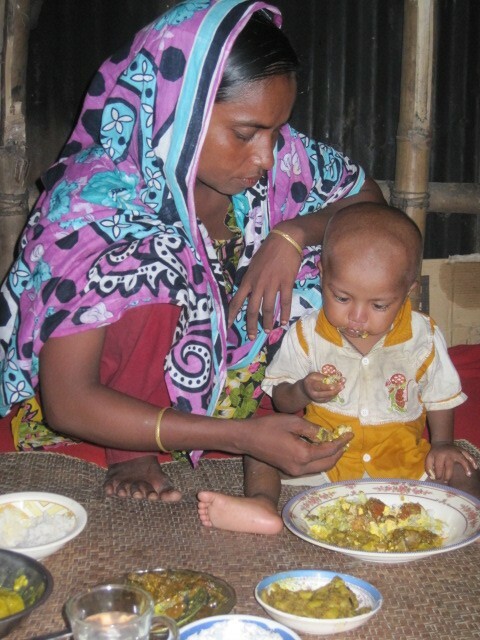 Once they were finished cooking, the mother sat with her baby and prepared some food for him. The community volunteers who work with the mothers encourage them to feed babies from the family menu to ensure they are getting the same variety of nutrients that the whole family is getting. The mother was shown how to prepare the food for the baby, to feed the baby a bit with her own hands (after washing them, of course), and to then encourage the baby to feed himself. The next day we visited another community called Rampasha where the direct participation of the MaMoni project has ended. 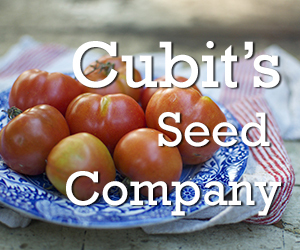 The programs are now self-sustaining in this community through local government and community volunteers. We met the mother of an 11 month old infant and she showed us the recommended practices for hand washing and infant feeding to ensure that the baby is able to safely eat a balanced diet. The mother was, of course, still breastfeeding but the baby was also eating 3 meals per day of food that comes from the family menu. They encourage mothers to provide a balance of different types of foods to ensure the baby gets all of the necessary nutrients. In cases where the family cannot afford to eat meat every day, they are encouraged to cook an egg for the baby to go with the rice, dal and vegetables that the family is eating. In this community and others like it, the program has been very well received and has helped mothers to better understand the practices that will keep their babies healthy, leading to improved health outcomes. Community engagement by both men and women who volunteer their time to learn about healthy pregnancy and health babies and to share their knowledge in the community is allowing these communities to take charge of their own health. In addition to one-on-one visits with individual mothers, the community also organizes community action groups that identify the key health problems facing mothers and children in their community and develop plans to address those through interventions and education. A variety of visual and written materials are used to support the community action group meetings. The pride that I saw in the community volunteers and local health workers in the Sylhet region brought a huge smile to my face. They obviously feel empowered in their role and take accountability for the health of their communities. Bangladesh has made incredible progress in terms of women's entrepreneurship through the Grameen Bank micro-loans and other initiatives. Now, through the MaMoni project that Save the Children participates in, women are also becoming empowered in terms of their own health and the health of their children. When women are empowered, we truly can achieve anything. This week, I'm in Bangladesh with Save the Children Canada. You can follow my trip, both here on my blog as well as on twitter (@phdinparenting) and my facebook page. You can also help make more programs like this a reality by asking Prime Minister Stephen Harper to sign a global pledge to end preventable child death by signing the No Child Born to Die petition or by making a donation to Save the Children. Thank you for sharing this unique experience; I've been fascinated with your twitter / facebook updates, and this entry now too. Look forward to seeing more. Thank you for this terrific report! And gorgeous photos too. I've been following your trip closely on FaceBook/Twitter too and I think you will have a tremendous impact communicating about this important work. I am so happy to read this <3 Thank you so much for sharing your trip! 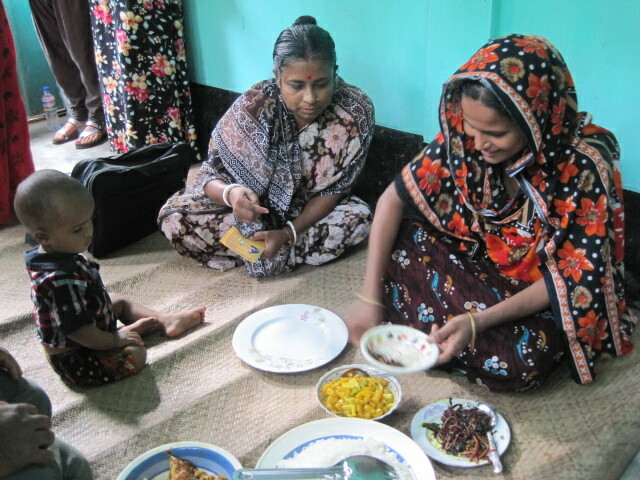 The nutritional initiative for families in Bangladesh looks wonderful, since under-nutrition is still a serious problem in South Asia. Thanks very much for sharing, and for the photos. I have to ask, though, does the INGOs' emphasis on a balanced diet of nutritious complementary foods for 6-12mo breastfed babies not cast some doubt on the idea heard on a lot of parenting boards, that as long as an older baby is having plenty of breastmilk it doesn't matter if they are eating virtually no solids? Merci Annie pour ces magnifiques photos et ton reportage! There is new evidence coming out about iron needs in babies that has resulted in meats or other foods that are high in iron being suggested as first foods. That aside, there is a difference between a baby being breastfed by a well-fed mother and a baby being breastfed by a malnourished mother. In a North American context, most babies are likely to get most of the nutrients they need from breastmilk, but in developing countries it may not be sufficient after six months and evidence has shown that babies who aren't introduced to solids during the second half of their first year do have poorer health outcomes. Just amazing Annie. Thanks for sharing your experience with us through pictures and words. What a once-in-a lifetime trip. Great story and great photos Annie. I love the photo of the wall where they track all the pregnant moms. So awesome. Thank you for the inspiring reporting and beautiful photos! I have a question: how do the mothers arrange their clothing to breastfeed so discreetly? I ask because here in the UK some immigrant mothers find it hard to wear their traditional clothes and also feed the baby - especially if they wear the shalwar kameez. I'm amazed because they must have been designed for breastfeeding - but it seems the latest fashions are for a tight fitting, long tunic. The shawl part of the sari looks very practical - but what do they wear underneath and what options are there? Many thanks for any light you can shine on this! Also want to say - the UK could learn a lot about maternity care from the projects you describe. Agree about the delivery room! They were wearing a dress under the shawl that was wrapped in a way that they could pull it down to nurse. The shawl seemed to play a very important role in keeping them covered, both for breastfeeding as well as in general. The women were constantly adjusting their shawls to ensure they were covered properly. WOW - not at all what I was expecting to hear back, am so relieved to be so wrong! I do wonder though...how many women are these organizations able to meet with one on one? The ones that do have such wonderful learning opportunities (from your description) but it must be difficult to reach every women in need, no? Were you able to get info, by the numbers? Thanks so much for your thoughtful posts, and your photos are beautiful! In the communities where the MaMoni project has been rolled out, they have complete coverage (i.e. are able to provide services to all of the women in the community). Rolling MaMoni out in a region requires an initial investment to get the infrastructure and health workers in place, to train volunteers, and so on. However, once it is up and running, the programs are self-sustaining. The small operating costs are covered by the government (e.g. salaried health workers) and a lot of the work is done by volunteers (who are trained and provided with the materials through the MaMoni project). 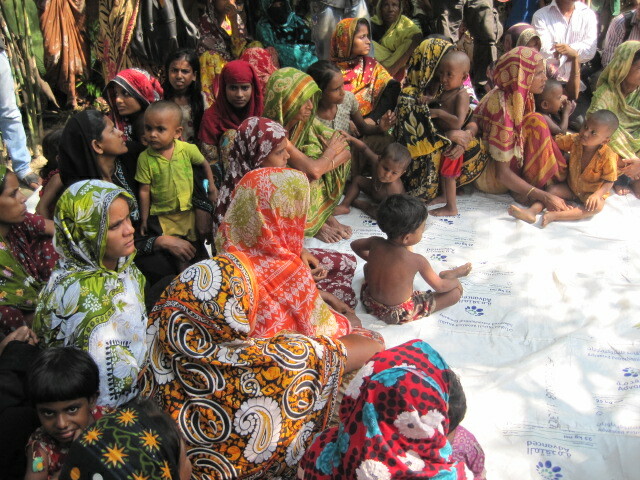 The best way to ensure that this reaches all women in Bangladesh is to donate to Save the Children (link in bottom of blog post) so that they can help roll this out to more communities.